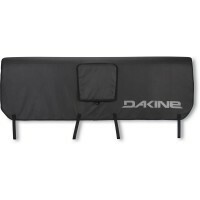 Dakine pickup pad DLX is a padded tailgates Protection for modern pickup vans. Thanks to the special Micro fleece lining protects the entire tailgate from damage. The pickup pad is attached with four straps, which are already included. A reflective Dakine logo and a anti-theft device provide the necessary security. Customer evaluation for "Dakine Pickup Pad DLX Diablo"
Artikel erscheint qualitativ wertvoll. Wird genutzt um Fahrräder auf einem PickUp zu transportieren .